Digital technology offers enormous potential for the government specially of a developing nation that wants to be ultra responsive to its constituents by keeping up with the current world and evolving for future needs, such government takes the route of electronic governance also known as e-governance. 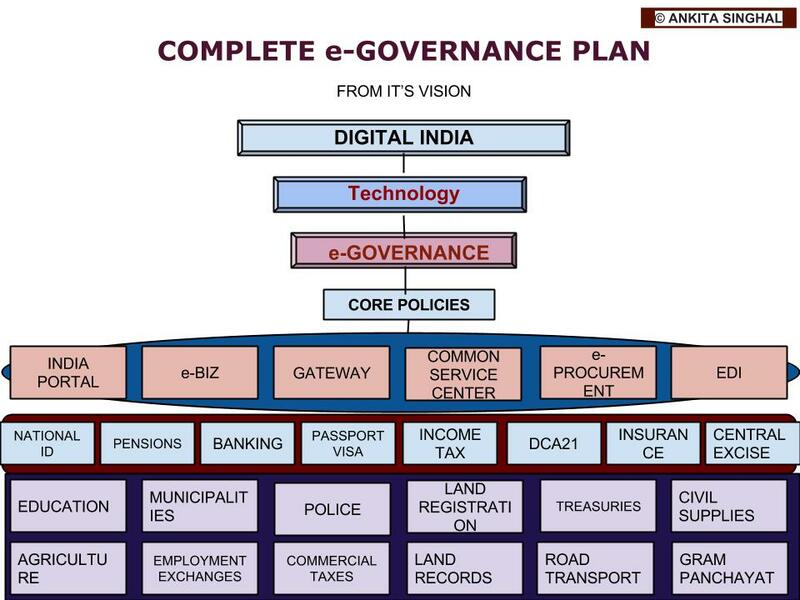 E-Governance in India, a major initiative under the ‘National e-Governance Plan’ (NeGP) of the Department of Electronics and Information Technology (DeitY), Ministry of Communications and Information Technology, Government of India, was approved in 2006 and it is the backbone of ‘Digital India’ vision. 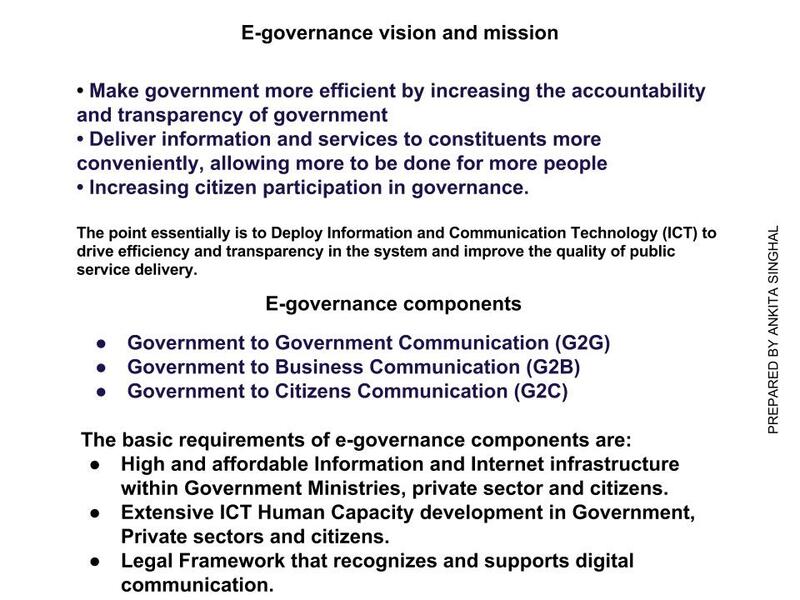 E-Governance is about Government’s interaction with government, it’s way of conducting business with companies and delivering services to its citizens by leveraging Information and Communication Technology (ICT) enabled strategies for ensuring transparency, efficiency, and accountability in the process which is not only faster but also more personalized and can be accessed 24 hours a day, seven days a week. It also entails integrating services across different governmental agencies in order to reduce cost structures, simplify interaction and improve overall service delivery in real time. It has envisioned large scale citizen services delivery through 1,00,000 kiosks upto village level, throughout India. It comprises of 31 Mission Mode Projects (MMPs), in three categories viz. central MMPs, State MMPs and Integrated MMPs. These MMps aims to provide services by leveraging and optimally utilizing the four pillars of IT/e-infrastructure namely – State Wide Area Network (SWANs), State Data Centers (SDCs), State Service Delivery Gateways (SSDGs) and Common Service Centers (CSCs). E-Governance is to make technology central to enabling change, it renders not only innovative technology but also a mechanism to modify the way government operates. Usage and application of Information and Communication Technology (ICT) involves several challenges as redesigning organizational and network structures, evolving consensus on basic issues, interoperability, leadership and change in management and processes according to the citizens’ and businesses’ needs. Along with these other major challenge are digital illiteracy (defined as the ability to operate a computer) and lack of internet penetration. Almost 70% of Indians live in villages and about 40% of population is living below poverty line. Albeit the mobile users are about 53% of the population still digital literacy is merely about 16% or lesser. If we have even one digitally literate person in every household then cent percent digital literacy can be achieved. To be able to utilize the maximum benefits of e-programs, 100% digital literacy is a must. To achieve this arduous goal, Intel has launched Digital Skills for India’ programme under which Intel will work with government of India to digitally literate 1000 panchayats through which 5 million citizen will be impacted by the end of 2015. Intel is also a partner in National Digital Literacy Mission Programme (NDLM). It has divulged in digital skills training application, which encompasses modules on digital literacy, financial inclusion, healthcare and cleanliness in five different Indian languages making it understandable. This application is free over android platform. 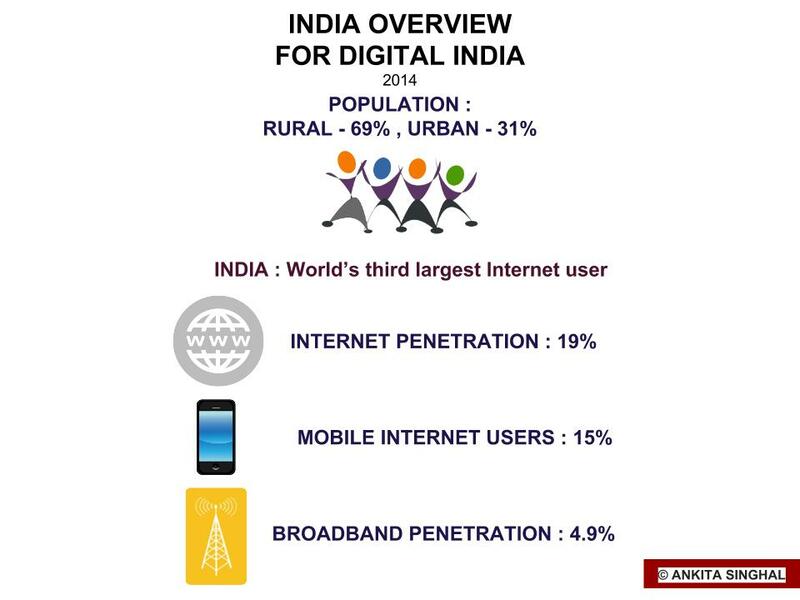 India is world’s third largest internet user still within India the broadband internet penetration is as low as 19% of the population whereas mobile internet users are around 15%. With 70% population in rural areas, if people don’t have access to internet then they can’t take the benefits of technology and e-governance, to overcome this issue of broadband connectivity in rural areas National Optical Fibre Network (NOFN) initiative is rolled out in which Intel is aiding government too, it will provide broadband to over 2 lacs gram panchayats of India. It will also achieve higher bandwidth enabling access to internet in rural areas. Digital India vision is an ambitious vision which will propel India on next generation growth and also is an umbrella term for e-governance which will need gigantic computing and network infrastructure to deliver citizen services which should be web based service oriented architecture the latest architectural paradigm of robust network connecting data as the conventional client server model of architecture will not meet the requirements. With right application, this digital India program will bring government, business and citizens much closer and all will work hand-in-hand in much efficient manner through technology, communication will no longer be a one way street. With government providing services in real-time and digitally literate citizens saving time and money, the result will be empowered government and citizens. Data security is of paramount importance as a lot of data will be online. With changing scenario, e-governance is taking maximum benefits of social media and mobile technology. Through the mediums such as twitter, youtube and facebook as such, government make announcements regarding policy making etc, take feedback etc. It is embarking it’s web presence through basic website and involving citizens by calling for their innovative ideas and suggestions. Cloud and Mobile platform are two emerging technologies which are already being used by government in some sectors and when used to its maximum potential can speed up the vision of digital India. Mobile alerts for basic needs such as Income tax returns, PNR status, for farmers- scheduling and progress regarding their crop sellout etc are already running successfully. The path to complete e-governance for digital India is daunting as it’s motive is to ensure the complete successfully implementation of e-government services to its citizens at large. Albeit we already have numerous innovative e-government applications successfully running yet many sectors are untouched. Innovation is the buzz, we citizens who have the capability to innovate should give our spare time to the government simply by innovating and thinking of out-of-the-box ideas. To encourage people Intel announced ‘Innovate for India Challenge’ last year. This is the screenshot of Prezi presentation I created. Clink on the image to see it. e-Health : One of the prime needs is providing an effectively working e-healthcare module in rural parts of India. e-Health is the application of ICTs across the complete range that affect the health sector in any way, from the doctor to the hospital staff, the patients , nurses, data processing specialists, social security administrators which will encounter chaos and delay in hospitals. We already have a web based blood bank management system in many states which is maintaining all the information pertaining to blood and is helping on case of emergencies so with a collective data at one place, time is saved leading to value of patients life. What we need for drastic change is online medical record program, e-HealthRecords, its biggest advantage would be fast access of medical history in case of an emergency. Also in rural areas, it will easy to track for the right medication specially for pregnant women which will improve women mortality rate also with children of rural areas getting right medication will lead to better heath and growth of the child. It will reduce the mistakes that sometimes happen in conventional medication system. Another step should be in the field of tobacco control by developing an internet based tobacco control network as it’s one of the major problem India is fighting with. With few digital foundation structures in place, the health care in India can see tremendous changes. e-District : This initiative will ensure a speedy delivery of services to citizens as centralized software applications will be developed for various departments for automation of back-end processing of applications, it will be in co-ordinate with the state administration. The services like social welfare, education, land records, food supply, rural development, transport, tax are already digitalized and will be delivering faster through e-District and the services with are not yet computerized like that of senior citizens etc will be digitalized soon. In conventional method, the database of people was scattered and an individual had to stand in queue of an individual department to get the service and time consumption was one major problem, don’t get me started on bribing system. So with this e-District program in place, not only it’s saving time but eradicating corruption too which builds trust in a citizen. e-Governance in Rural Agricultural Development : With 70% citizens dependent on agriculture, technology in Agriculture sector, Livestock sector and Fisheries sector is a lifeline. With the help of its multiple services a farmer can get benefited from the information of crop and help throughout crop cycle to electronic certification in export and imports, e-governance can change the complete picture. With changing weather drought relief management will be easy and crop production management will ensure less wastage and fair price of crops from farmers to consumer’s end. Farmers can easily evaluate/implement schemes and programs, Livestock management will be proper, land registration/pricing, etc will lead to lesser suicides of farmers. This complete project has the major potential to empower farmer and once they are empower then no one stop India from being a developed nation. Passport seva – online passport application anytime anywhere, can be scheduled and tracked in real-time. Indian Railway reservation system – Online booking from anywhere in the world in real time. Online Income tax filing: e-filing enables a citizen to file for income tax returns without delay anytime. Online land records registration : e-registration enables faster seamless real-time process. Online registration for driving license, learners’ license, license renewal and duplicate license, Online payment of electricity bills, Free download of departmental forms, e-transport, Urban Administration Department (Water tax calculation & Water tax payment , Property tax calculation & Property tax payment, Birth & Death certificate registration) etc. Proposed (by me from my understanding) : e-Visas, e-voting, e-Police. e-Justice. 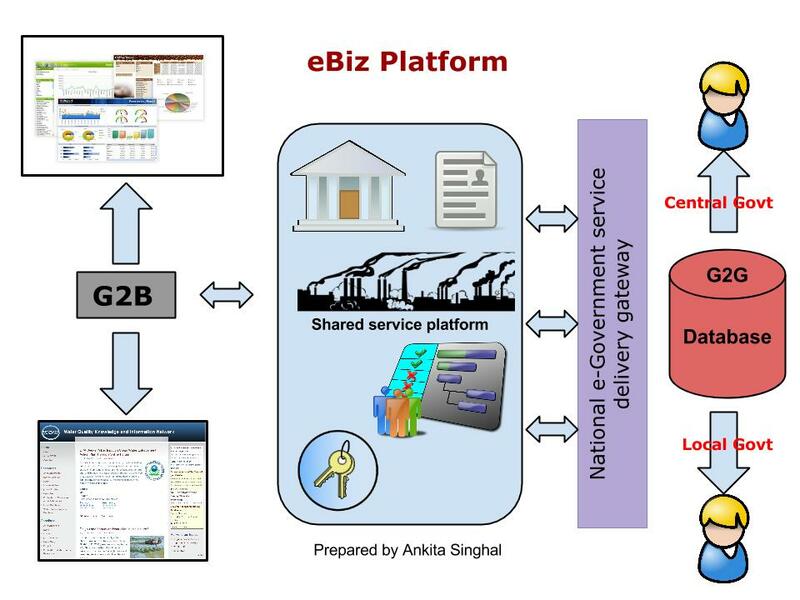 e-Biz – Transform the business environment in the country by giving a customer-centric platform rather than the department-centric. It focuses on providing services 24*7, one stop-shop for all business licenses and permits, Eliminate the need to physically interface of various regulatory bodies, provision to businesses to file applications for various returns, pay taxes and submit compliance through a single interface. 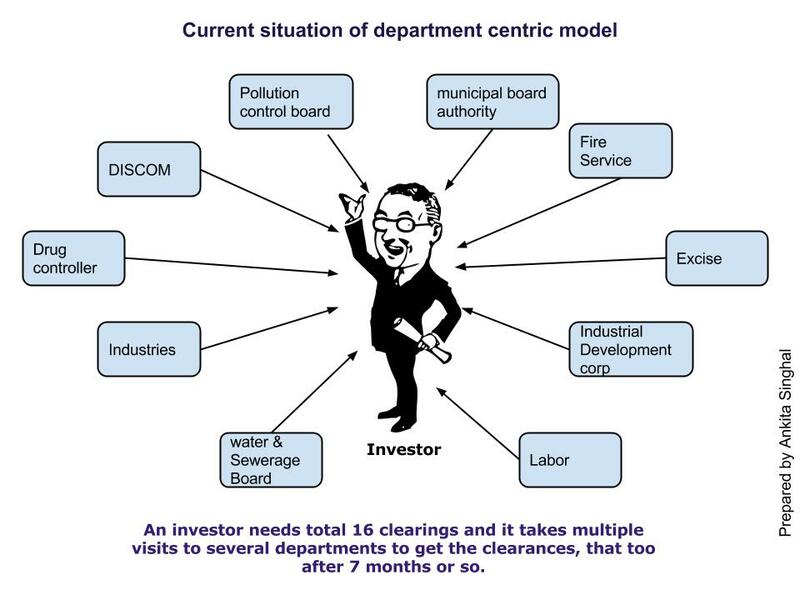 When a composite service is designed by Joining up the workflow of the back end departments in optimum manner that a single request form from an investor can be linked to the government authorities in logically sequenced manner, the prime vision will be achieved will will attract more investor in the country, leading to better economy thus more empowered nation which can provide better services with more budget at hand. Not only Business will benefit but government will benefit too with 100% fair amount directly in government’s department and more business opportunities. e-Trade – Governance of foreign trade’s main concern is increasing Indian’s shares in global trade and e-trade mainly focuses on easy process, it’s objective is to facilitate trade by providing an online interactive scenario to many parties so that they obtain services effectively and efficiently. 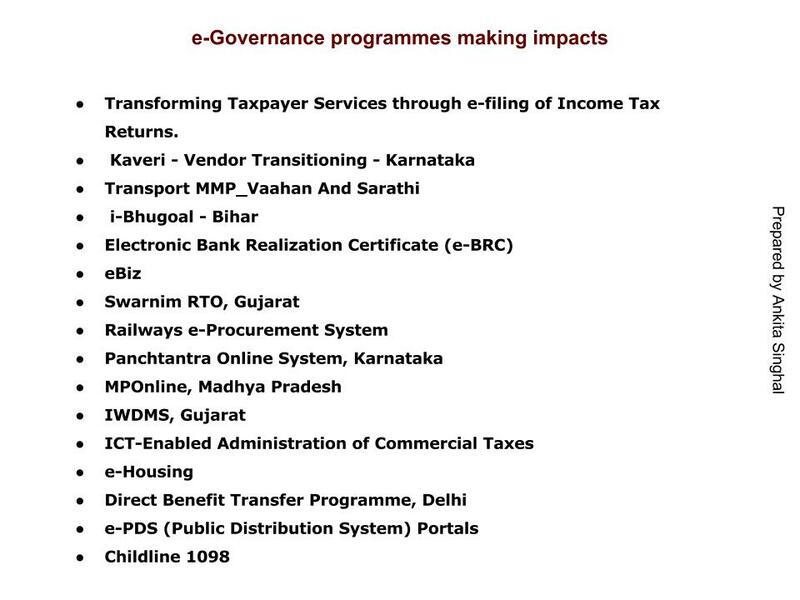 It includes e-delivery, e-filing, e-payment for exporter/importer/agent etc. 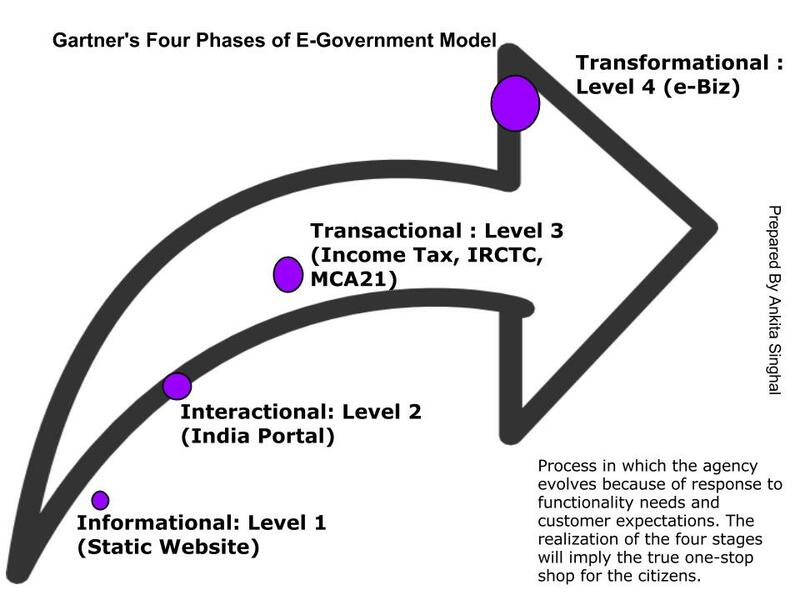 With awesome technology some operating e-governance structures are in place and having scope in many sectors, it is one of the key enabler of digital India, albeit in many unsuccessful e-governance programme but with proper digital literacy and implementation of the model to level 4, it can be a one stop-shop for each citizen thus empowering them leading to a digital Nation.